Cream puffs are a simple but decadent dessert that you can make at home for a little taste of luxury. Chantilly cream is nestled between rounds of flaky pâte à choux for a lovely balance of light pastry and soft, sweet cream. 1. Preheat oven to bake at 375°F (190°C). 2. In a saucepan, combine the water, butter, salt, and sugar (if desired). Bring to full boil. 3. Pour liquid into mixer. Add the flour all at once. Using the paddle attachment, mix on medium speed for 1 minute until the mixture has cooled slightly. 4. Add eggs one at a time. Make sure each egg is completely mixed in before adding the next. Repeat until the mixture reaches a shiny, firm consistency. 5.Prepare a pastry bag with a large star tip and add choux paste to the bag. 6. Pipe the choux paste onto the lined baking sheet in domes of about 1″ in diameter. 7. Bake at 375°F (190°C) for 10 minutes, then turn back to 350°F (176°C) for another 20 minutes. The puffs should be brown on the outside and dry on the inside. 8. 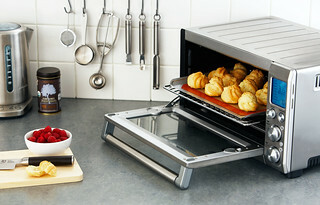 Remove puffs from oven and allow to cool completely on rack before cutting and filling. 1. It’s best to chill your mixing bowl and whisk before adding the ingredients. Place both in your freezer for about 10 to 15 minutes before mixing, and you’ll have a much fluffier, well-composed cream. 2. Place the cold cream in your cold mixing bowl and whip on high until it forms soft peaks. 3. Add sugar and continue to whip until it forms stiff peaks. Be careful not to overwhip the cream, or it will become grainy and separate with a buttery flavor. Once the puffs have cooled, cut each in half using a serrated knife. Using either a spoon or a pastry bag, place desired amount of cream inside the hollow of half of the puff, then sandwich it inside with the other half. If desired, add fruit, chocolate pieces, or other extra goodies on top of the cream before replacing the puff top.